I know. I know. I know it’s supposed to be “beat” but I love this song and every time I eat beets, I hum that song. So, of course, as I eat the Orange Scented Beet Salad from a new cookbook by Jill Nussinow, the Veggie Queen, called Vegan Under Pressure, I can’t keep that song out of my head. I have to admit, since I am no longer a vegan, I was a little hesitant when she approached me to review her book. 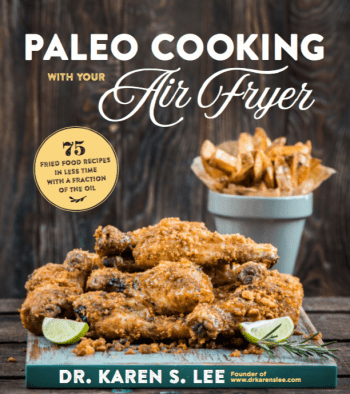 I mean, I do eat a lot of vegetables – mostly, actually – but I wasn’t sure if the cookbook would recommend using processed ingredients vegans are known to use, like fake meats, or a lot of tofu derived products or vegetable oils or margarine. Even when I was a vegan/vegetarian, I didn’t eat those fake foods, so, to review a cookbook that might use those ingredients was a bit unsettling. But I agreed to check it out because the recipes on her blog use mostly fresh whole ingredients. And if she uses seitan (fake wheat meat), she actually shares her own recipe how to make it. Plus, the book is all about cooking vegetables in a pressure cooker – my latest love in the kitchen! And we both belong to a large Instant Pot Facebook Group (38,000 members and growing!) and I see her helping out the community about cooking vegetables in a pressure cooker often so how could I refuse? In leafing through her pretty and well-organized cookbook, my initial worry was laid to rest. Her book is amazing. She uses fresh and whole ingredients – no boxed stuff or fake pretend foods. She doesn’t use butter but that’s ok. She recommends coconut oil, olive oil, vegetable stock and always fresh produce. No canned ingredients either! I would make any of her recipes and I’d be perfectly fine! The only thing about the book is… I wish there were pictures to go with the recipes. There are a few pictures in the middle of the book – and they are gorgeous – but more the reason why I wished the same gorgeous pictures accompanied the other recipes. What can I say? I’m visual and I love staring (and drooling sometimes) at food pictures. But maybe that’s just me. Anyway, the recipes are amazing as they are even without pictures. For anyone who enjoys cooking with a pressure cooker and loves vegetables (who doesn’t? ), Vegan Under Pressure should be part of your cookbook collection. 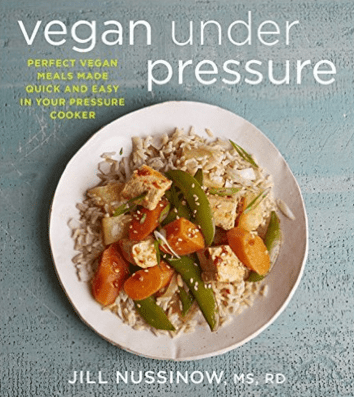 In addition to all the drool worthy plant based recipes, Jill shows how to use the pressure cooker safely and effectively and has a helpful cooking times tables in the beginning of each chapter to help you prepare a variety of vegan dishes that even non-vegans would love. She even has spice blends and seasonings recipes too so you don’t have to buy processed (usually irradiated) spices. Whether you are a vegan or just someone who enjoys cooking vegetables and quickly, you will love this cookbook. So today, I want to share The Orange-Scented Beet Salad recipe with you because I love beets! Beets is detoxing for the liver, knock out gorgeous color, great for gut health as kvass , and cooking it according to the recipe was lightening FAST in the Instant Pot. 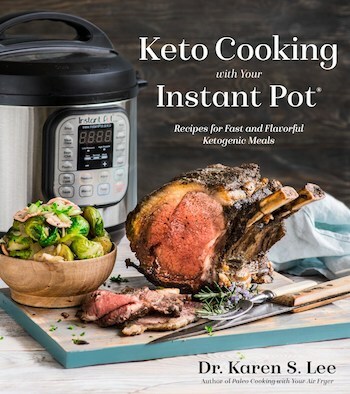 (Affiliate link to Instant Pot. Use discount code “DRKAREN50” to get $50 off) It would normally take about an hour to roast in the oven but not in Instant Pot! What I did differently from her original recipe, though, is omit added sugar and instead, use my tangy Orange Mustard Vinaigrette (see recipe below), top with carrot strings, blue cheese crumble and clementine segments. You can leave out the cheese if you are avoiding dairy. I just think it compliments beets really well. 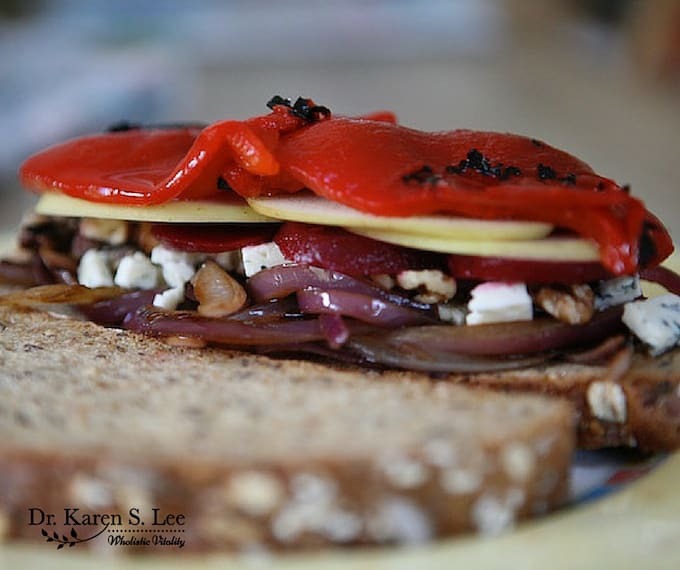 And what’s even better than using it in the salad is using it to make this amazing Beet, Caramelized Onion and Apple Walnut Sandwich. Make this salad today. Keep the beets in a sealed jar and use it throughout the week. And check out Jill’s Vegan Under Pressure. (Amazon Affiliate Link) You’ll add more variety of plants to your diet quicker than you can wash them! 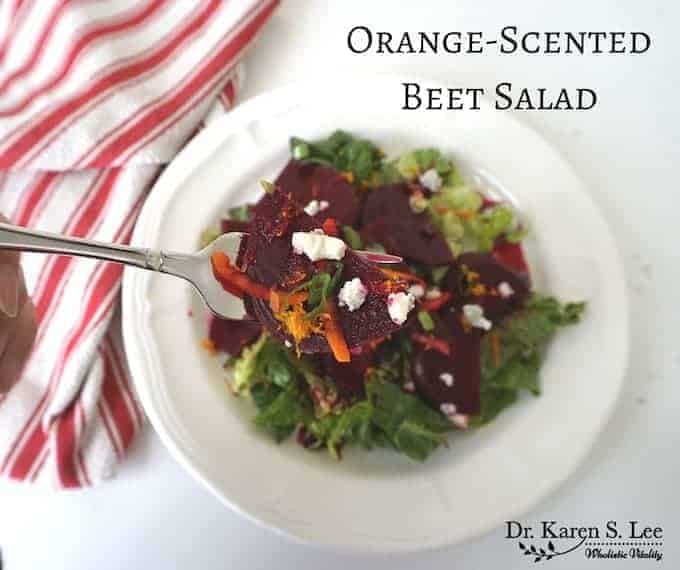 Credit: Orange Scented Beet Salad is posted with author’s permission. Orange Mustard Vinaigrette is my own recipe. Combine the orange zest strips, orange juice, and vinegar in a pressure cooker. Add the beets. Bring to high for 7 minutes, then release any remaining pressure. Remove the lid carefully, tilting away from you. Remove and discard the zest strips. Stir the Sucanat and mustard into the beets. Mix the grated orange zest and scallions into the beets. pour the liquid from the cooker over the beets. Divide the greens among 4 salad plates, spoon the beet salad over the greens, and serve. **I added blue crumble cheese but you can omit them if you are avoiding dairy. **I used clementines strips and grated zest so I added the clementine segments to the salad. 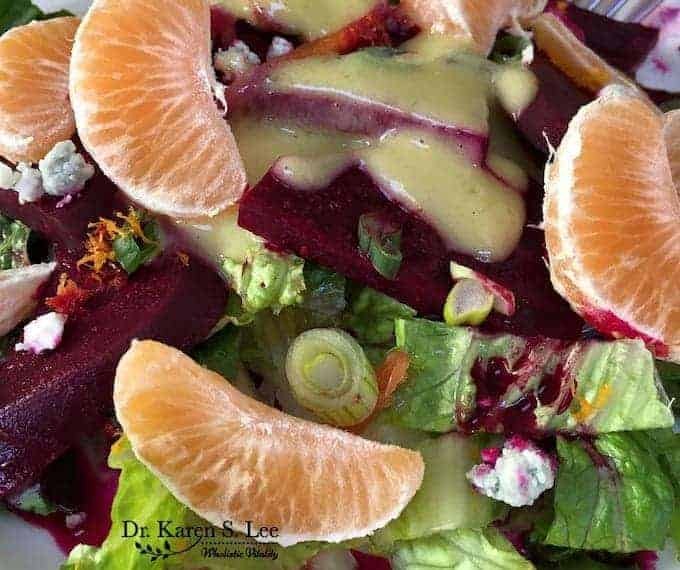 It made sense to me since it's called Orange Scented Beet Salad so why not use the orange segments after using the peels and the zest? Also, since I didn't use additional sugar, the sweet and tanginess from the oranges added additional depth of flavor. **You can use additional salad dressing like I did. See the recipe below. Mix all the ingredients in a salad dressing bottle or mason jar and shake well.